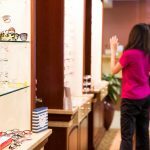 Moorestown Eye is fortunate to have a qualified staff of specially trained optical technicians who have a knack for finding the latest in high fashion frames while keeping your budget in mind. Our optical staff attends frame fashion shows each year in New York City in order to know the trends even before they reach Moorestown and Mt. Laurel, NJ and they have received additional training to understand the complex nature of picking the right frame for each person's individual face shape. Our frames range in price from under $50 to over $200 to fit any budget and fashion ideal. Feel free to bring them your questions and your ideas for how your "envision" your future. 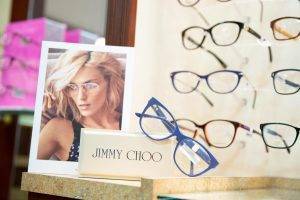 Looking For Eyeglasses in Moorestown, NJ? Many people believe that the only determining factor in how you see through glasses is the doctors’ prescription. That is simply not true. We could put the exact same prescription in a standard plastic lens OR in a hi index material lens with anti-reflective coating and YOU WILL SEE BETTER in the latter glasses. 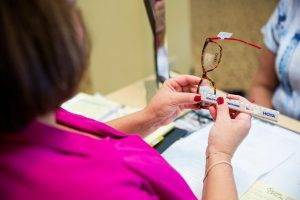 The prescription is only part of the equation; the lens materials, coatings, and frame selection are an equally important component! Not only do lens material and coatings make a difference, but lens design does as well– ESPECIALLY IN PROGRESSIVE BIFOCALS. You’ve heard that old adage, “You get what you pay for”? Well, that is very true with glasses. Some earlier generation progressives are a little “harsher” on the vision. They tend to have a narrow corridor of clear vision and can cause dizziness. Most reputable optical shops no longer use this dated technology, although you can still find it advertised in those 2 for $99 type specials. Today’s better quality digital technology lenses with laser cut progressions are more like natural vision and often work for people that have been unsuccessful with progressives in the past. However, these newer lenses are manufactured with high tech laser machinery and, as such, cost more. A patient can find progressive lenses that range from under $100 to over $300 and it is very tough to compare apples to apples without knowing the brand of the lens for which you are receiving a quote. At Moorestown Eye Associates, we recommend the best products for your individual visual needs! But we also know that patients must balance Vision And Budget. We like to say, “we only look expensive” about our remodeled office and state of the art equipment. Consumer Reports studies prices in the eye care world each year and consistently reports that private eye doctors offices are actually LESS EXPENSIVE than those large chain shops that advertise on price. Moreover, recent studies have found that glasses purchased over the internet were incorrect over 80% of the time! Finally, if you have a vision plan such as Eyemed or VSP, your prices are the same EVERYWHERE as the additional extra prices and formulas are set by your insurance company! Please work with us to offer the best options for you! If a top-of-the-line digital progressive with anti-glare technology in a titanium drill mount frame just isn’t in the budget this year—that’s fine!! Let us help you find the best optical options for your budget! We offer ALL price ranges! Our staff consists of highly educated opticians and optical technicians– they know the products that exist and the advantages and disadvantages and price ranges of them all. And, if you compare apples to apples, you will discover that it is true...we only look expensive! Click here to get information on the new law requiring sports goggles for children in NJ. Color blindness has been around for as long as anyone can remember, but for the first time, one can see the vibrancy of color! Enchroma created glasses that can separate wavelengths of light like a filter.